In Room 718 (Denon Wing, 1st Floor) hangs a painting by Giovanni Paolo Panini, Préparation du feu d'artifice et de la décoration de la fête donnée sur la place Navone à l'occasion de la naissance du Dauphin (Preparation of the fireworks and decoration for the celebration given in Piazza Navona on the occasion of the birth of the Dauphin).1 From November 20 to November 30, 1729, Cardinal Melchior Polignac, Ambassador of France to the Holy See, hosted a series of festivities in Rome to celebrate the birth of the Dauphin Louis, son of King Louis XV of France.2 Pier Leone Ghezzi designed a group of temporary columns and arches in the Piazza Navona for the occasion. The painting by Panini shows a visit to Piazza Navona by King James III and VIII, his two sons, and the Earl of Dunbar (Governor of the Prince of Wales). King James can be seen to the right of the central obelisk and fountain in front of the temporary arch on the right. He wears a long brown coat and a black hat. 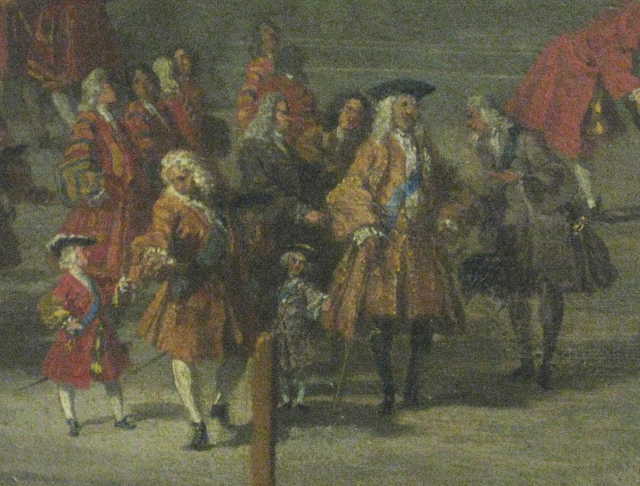 To his left is Lord Dunbar who holds by the hand Charles, Prince of Wales (later King Charles III) and Henry, Duke of York (later King Henry IX); Charles wears a long red coat and a black hat. The royal party also includes two other courtiers and seven liveried servants. King James can be seen on the right side of the theatre one level up from the ground floor in the only triple box. He is seated on a high backed red chair immediately above the monogram of King Louis XV (two letter Ls). He wears a gold coat with the blue sash of the Most Noble Order of the Garter. Next to him is his son the Cardinal Duke of York (wearing black and a red zucchetto), Cardinal de La Rochefoucalud (wearing black with the red collar of the Order of the Most Holy Spirit), and the Earl of Dunbar (wearing the green sash of the Order of the Thistle). 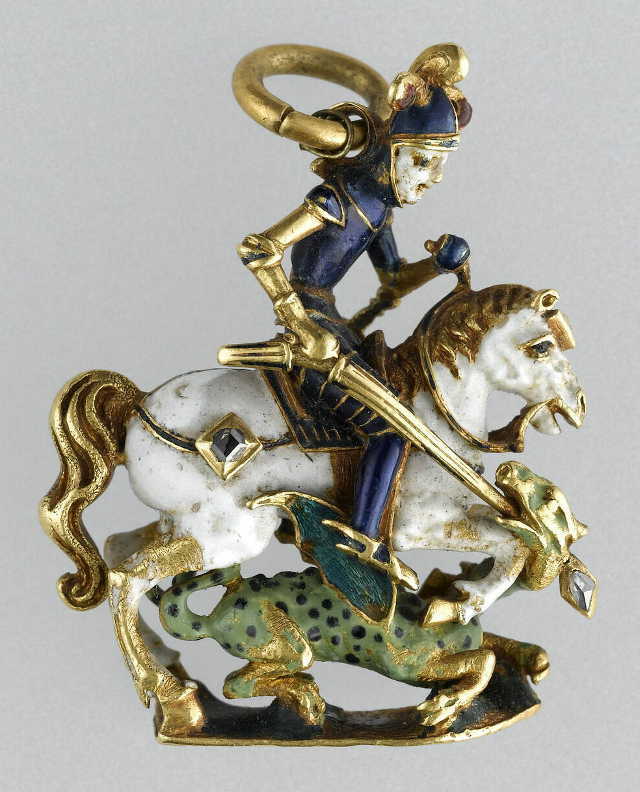 In Room 531 (Richelieu Wing, 1st Floor) there is an insignia of the Most Noble Order of the Garter.5 It is 4 cm high and made of enamelled gold. It was given to the Louvre in 1856 by the antiquarian collector Charles Sauvageot. 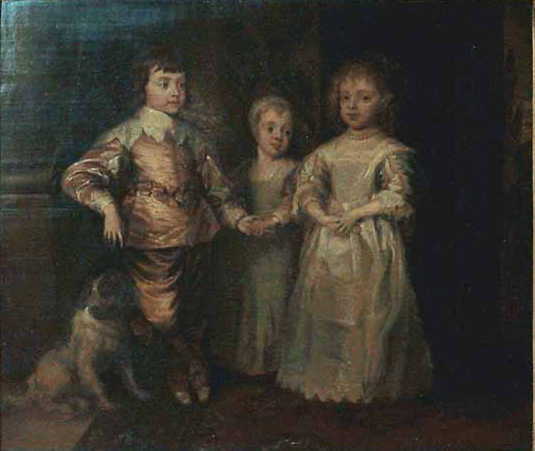 In Room 854 (Richelieu Wing, 2nd Floor) hangs a copy of Sir Anthony Van Dyck's group portrait of the three eldest children of King Charles I: the future King Charles II, King James II, and Mary, Princess of Orange.8 The primary version of this portrait hangs today at Windsor Castle. It was painted by Van Dyck in early 1636 after King Charles I expressed dissatisfaction with the 1635 group portrait of his three eldest children commissioned by Queen Henrietta Maria and now at the Galleria Sabauda in Turin. The Windsor Castle version of the 1636 portrait includes a second dog at the feet of Princess Mary. 1 Atlas base des oeuvres exposées (INV 415). The painting measures 107 cm high by 248 cm wide. 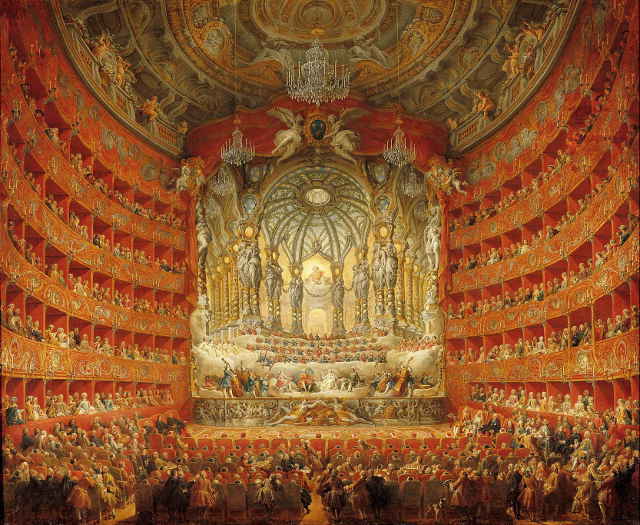 Giovanni Paolo Panini was born in Piacenza in 1691, and died in Rome in 1765. 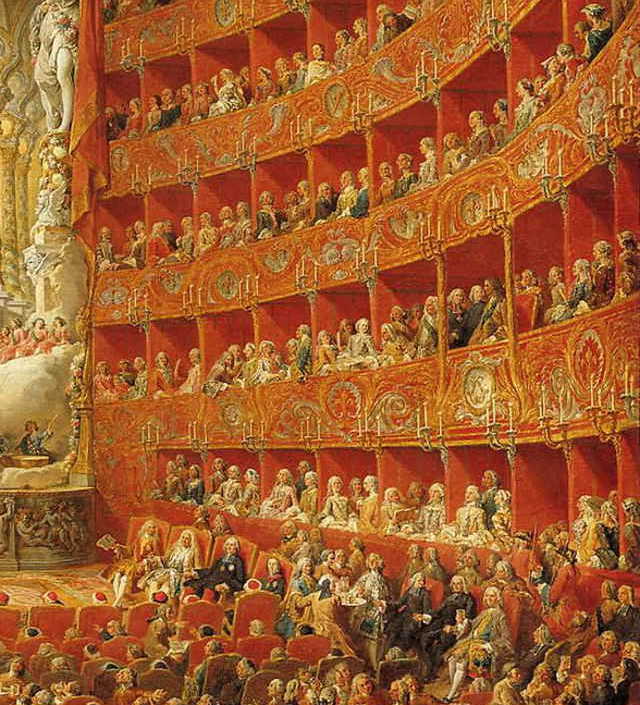 The painting was commissioned by Cardinal Polignac who sent it as a gift to King Louis XV. 2 Cf. Diario ordinario (Roma: nella stamperia Cracas): numero 1920 (26 novembre 1729) and numero 1924 (3 dicembre 1729). The Dauphin Louis was the father of the future Queen Marie Clotilde of Sardinia (wife of King Charles IV), as well as of her brothers King Louis XVI, King Louis XVII, and King Charles X of France. 3 Atlas base des oeuvres exposées (INV 414). The painting measures 205 cm high by 246 cm wide. 4 Cf. Diario ordinario (Roma: nella stamperia Cracas): numero 4677 (15 luglio 1747). 5 Atlas base des oeuvres exposées (OA 593). 6 Atlas base des oeuvres exposées (OA 11859). 7 The duc de Fitz-James was first chamberlain to the comte d'Artois before he succeeded as King Charles X of France..
8 Atlas base des oeuvres exposées (INV 1237). The painting measures 47 cm high by 57 cm wide. It was formerly owned by Prince William V of Orange. In 1795 it was stolen by the French Republic and transferred to the Louvre. 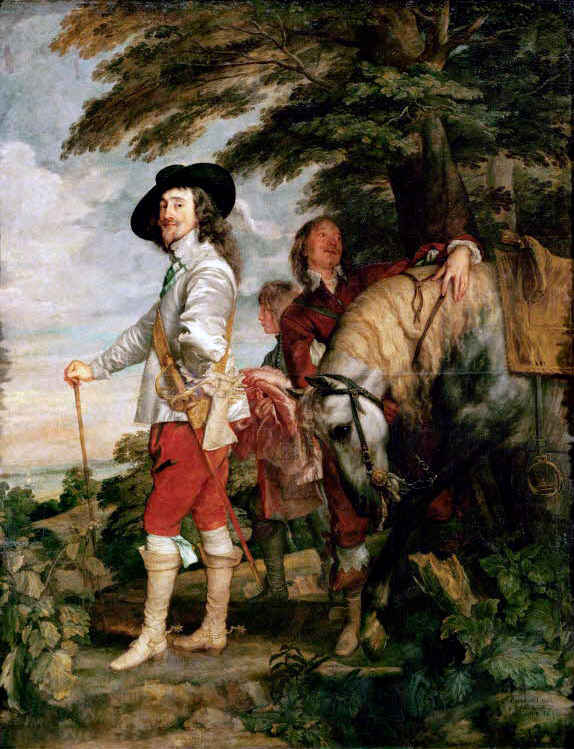 10 The portraits were formerly owned by Louis Joseph, Prince de Condé, and hung at the Château d'Écouen. When the Prince de Condé emigrated from France in 1793, the paintings were seized by the French Republic and transferred to the Louvre. 11 Atlas base des oeuvres exposées (INV 1238). 15 Atlas base des oeuvres exposées (INV 1236). The painting measures 266 cm high by 207 cm wide. It was in France by 1738. 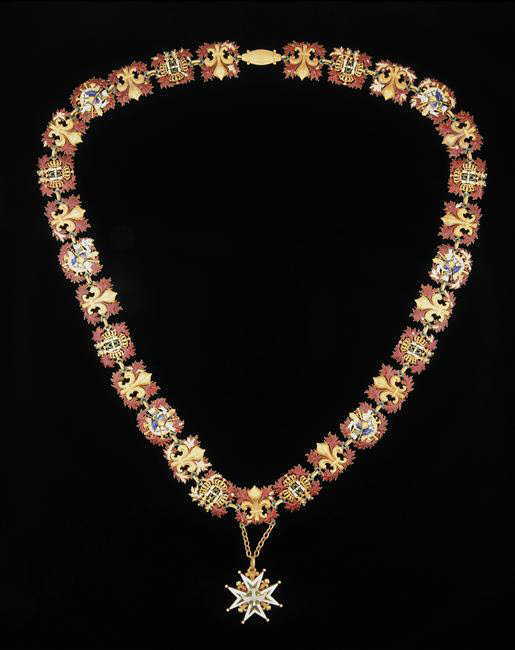 In 1775 King Louis XVI bought it from the comtesse du Barry. The painting formerly hung in Room 853, Richilieu Wing, 2nd Floor. This page is maintained by Noel S. McFerran (noel.mcferran@rogers.com) and was last updated March 10, 2019. © Noel S. McFerran 2019.